The benchmark Index NIFTY50 continued to witness fierce consolidation as it ended a volatile day of trade on Tuesday nearly flat with minor gains of 6.65 points or 0.06%. The highlight of the session was the serious resistance that the levels of 10490-posed in the morning trade. The Markets immediately retraced once it tested its resistance area. The area of 10490-10535 will continue to remain critically important area that the Markets will have to breach for a comprehensive breakout. While the levels of 10490 and 10535 will act as immediate resistance area, the levels of 10405 and 10365 will act as supports. The Relative Strength Index – RSI on the Daily Chart is 55.7205 and it continues to stay neutral against the price. The Daily MACD is bullish as it continues to trade above its signal line. No significant formations are observed on Candles. The pattern analysis have once again reinforced the credibility of the resistance of the 10490-mark. 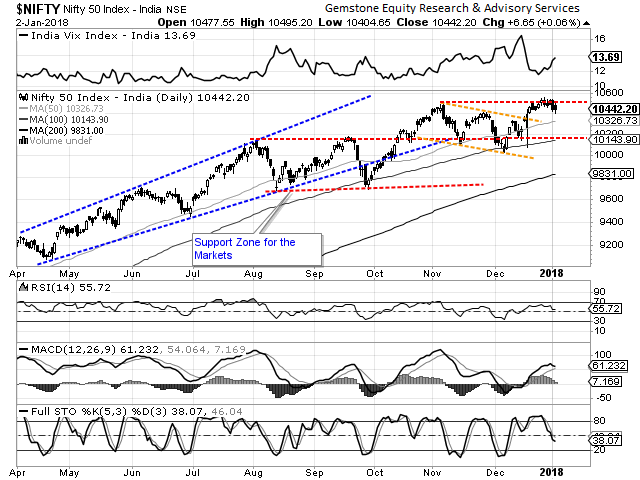 Going ahead, the zones of 10490-10535 will continue to act as major resistance. 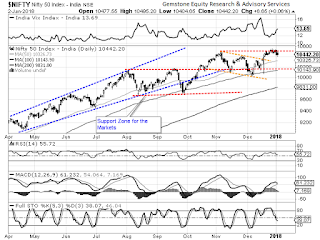 While the mentioned zone of 10490-10535 acts as immediate resistance, the Inter-Market Analysis offers cues as to whether we will see deeper and serious correction or just plain simple range bound consolidation. Our Markets historically enjoys very high and strong correlation with the Hang Seng (Hong Kong Index). This Index has broken above its previous highs and now trades at historically high levels. In all likelihood, we may resume our up move after much under-performance vis-à-vis the Asian peers over previous days. However, until this happens, we need to approach the Markets with caution. Until the directional up move is re-established, exposures should be kept limited. Highly stock specific approach but positively cautious view is advised for the day.